Lots of these tips are squarely in the restoration and not conservation camp. 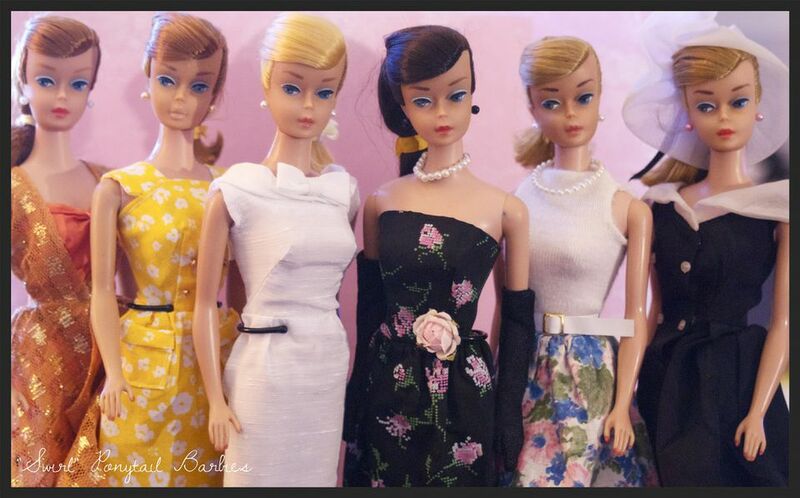 Most Barbies are not as rare or historically important as, say, antique dolls from the 1800s. That said, please note that you can ruin the value of a doll with a bad restoration, and also that many collectors do not want to purchase restored dolls (hair restyled, lips repainted, etc.). However, if you have some basket-case Barbies you want to fix up for your collection, or even for sale if you make full disclosures, then the following tips are invaluable to help you fix up your dolls! Many different formulas for plastics are used, just like composition dolls, so disintegration is happening at different rates for different dolls. Plastic dolls can smell bad when they are degrading, or they can get sticky. They can also show a white powder caused by leeching plasticizer that many people mistake for molds. Or, they can get sticky faces (see below). There are no known ways to stop the plastics from degrading once that starts, only ways to cosmetically treat the problems. Certain types of vinyl, including the vinyl used for certain #4/5 Barbies, are susceptible to stickiness from migrating plasticizers. Also, dolls made of hard and soft plastics often cause disintegration in one another—where the materials meet sticky. You can make a barrier between these pieces—use kid glove or pellon. It will work for a while to not cause further stickiness. To treat the stickiness, many people will clean a doll with alcohol (highly abrasive and takes more plasticizer out of the doll!) then use talcum powder to wick up stickiness. We would personally wash the face with mild soap and then use the talcum powder. Another possible remedy for sticky faces is Twin Pines Formula 911. Many Barbie collectors use Plastix, made by Locite, to repair neck and leg splits in vinyl. This is a two-part super-glue gel. Others use vinyl repair compound made for pools. Who knew that the little Barbie earrings from the 1960s would cause so much trouble if left in the ears of the dolls for, oh, say 30, 40, or 50 years? Well, those little earrings do cause a heap of trouble. The metal in the earring posts has interacted with the vinyl of the dolls and turned many ears, and even sides of Barbie faces green. Hence, the name for the condition is green ear. To repair Green Ear, you'll need a product from Twin Pines of Maine called Remov-Zit, plus some time and patience for application and re-application of the product until the green ear is gone. There is no known cure for this problem—metal inside of a doll limb will cause green marks in the plastic. You can see this effect in many Dawn dolls from the 1970s, on the knees of the dolls. Many collectors successfully use regular shampoo (baby shampoo is good) and conditioner to shampoo a Barbie—some people also successfully wash with mild, regular soaps such as Joy, then use fabric conditioners such as Downy to soften and detangle hair. However, some collectors have also reported that Downey will fade the hair color on certain Skippers and Twist and Turn dolls. In any event, if you use a fabric softener on doll hair, make sure it is dye free, and dilute it. You can set Barbie's hair by rolling (wet) onto cut straws or bobby pins. You can also set Barbie's hair on thin metal tubing if you have it available (great for doing a tight curl on the end of a ponytail). Set the hair into boiling water briefly to set the curl (not the doll!) and then let the hair dry before removing your curlers. Bobby pins work great for setting bangs. You can reflock Ken heads! To reflock, buy "turf" material that can be used for reflocking, sold at hobby shops. This is the material used by model car builders when they are making "velour" seat covers! If you have a tiny area to reflock, you can fill in. However, if the head is a mess you might be better off scrubbing off the old flocking with soap and water. If appropriate and needed, first paint the area to be flocked with Liquitex acrylic paint. Then, use white water-soluble glue to paint a thin area of glue all over the head, forming a hairline as you paint (with a small brush!). Put the flocking in a metal strainer with small holes, and sift it all over the head while the glue has just slightly started to dry. Pat Ken's head gently to set up the flocking. After the glue is dried, you can blow off any excess flocking. You can glue over the flocking if you missed spots, but we don't recommend it as the flocking doesn't look very neat after that is done. This doesn't work for limbs attached by mechanisms. But, if you have a limb that is ruined, and you have a donor Barbie lying around one in bad condition but with a lovely limb), here is what you do. To pop out the arm, boil water and dip the limb and torso hole in the boiling water for about 30 seconds. Then, the arm should be easy to pry out (gently!) without splitting the torso vinyl. Then, do the same to the donor doll. Take the desirable limb, again dip the shoulder on the doll receiving the limb in boiling water for 30 seconds, gently put your new limb in, and, there you have it, a whole doll with an improved limb! Barbies with splayed legs? Not very attractive. Here is how to fix bad gams on your Barbie. Again, boil the water and dip the legs in to soften the vinyl. Remove the doll, and straighten out the bent leg, ankle, etc. Hold it in the correct position for a while; you then may want to tie the doll's legs in the proper position using soft ribbon, etc. You don't want to use something like a rubber band that can leave a mark in the soft vinyl. Most collectors use Liquitex acrylic paints to repaint Barbie features. Use the tiniest brush you can find. Be careful when you repaint lips! The paint can bleed into surrounding vinyl. It can be removed usually with Remov-Zit, made by Twin Pines. Working under a lighted magnifying glass can greatly help! Brows are the hardest feature to repaint and have them look normal. You will need to mix brown, white and black paints to get the right color, which varies from doll to doll. You will also have to measure (use a doll with nice brows to do this) the brow, including the arch. You can use tiny, light pencil marks as a guide. Barbie's eyebrows are not usually totally symmetrical, so you won't have to copy the right and left exactly, but you'll need to get the "look" right and using a doll with good brows as a guide will help. If you ruin them, you can take the Liquitex off with alcohol and toothpicks. Do you like the look of the small pearl Barbie earrings, but don't want to risk a case of nasty Green Ear? You can get the "look" by using little white pearls on bridal sprays from craft stores! The pearls are on plastic monofilaments, not metal, so there is no risk of green ear. The following have all been used by various restorationists to remove ink and magic marker stains from vinyl dolls: Goo Gone, Remov-Zit and photo emulsion cleaner (Tech 12, from archival houses). Our favorite is Remove-Zit from Twin Pines. We do use the popular Twin Pines products formulated by Nick Hill for the restoration of my basket-case Barbies, and we have had success with them. However, the curator of the Strong Museum advises caution, since we don't know what chemicals are in these products. In any event, none of these remedies for removing ink is archival. Be cautious when using any of these products on mod-era dolls, as they can remove the skin tones. If this happens, check out the Twin Pines site for information on using magic markers to re-dye the doll's skin using Eberhard Faber's Design Art Markers. Try a hot glue gun without the glue to gently melt the plastic to close the hole (very risky, but can work).